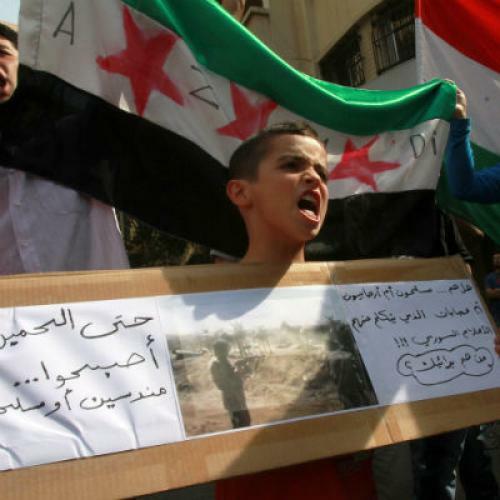 The fate of the Syrian revolution may reside in that one sentence. Syrian Kurds who have joined the call to revolution against Assad have nonetheless been frustrated in their attempts to secure adequate representation in the opposition’s nascent government-in-exile in Turkey. If they aren’t accommodated—and fast—then the SNC won’t have much standing as a representative transitional body worthy of international support. Indeed, it’s only with the support of Syria’s Kurds that the SNC will be capable of earning the allegiance of a critical mass of the Syrian population. Syrian Kurds make up between 15 and 20 percent of the total Syrian population (the exact figure is unknown because no real census has been taken in Syria for 50 years), making them Syria’s largest minority group—larger even than the ruling Alawite sect which has so far proven largely loyal to the regime. Kurds are everywhere in Syria, although their communities are concentrated in the north and northeast of the country. As in other Arab countries, they’ve been a repressed minority, with laws against the use of their language in Syrian schools and against their holding passports and ID cards (without which land deeds can’t be tendered). Kurdish territory in Syria had been confiscated by the Ba’ath regime and given to Arab Bedouins; the government has routinely intimidated Kurds attempting to celebrate Kurdish holidays, including the Persian New Year, to which the Kurds have added their own distinct coloration. The broader protest movement seemed glad for this support. In April, one of the Friday “days of rage” was named “Azadi Friday,” in solidarity with the Kurdish protestors (“Azadi” is the Kurdish word for “freedom.”) Meanwhile, the brutal assassination of Kurdish opposition member Mishal Tammo in early October in the city of Qamishli hardened many Kurds’ resolve against the regime. But if a good number of Kurds appear willing to turn against Assad, they’ve been wary about joining forces with the SNC’s government-in-exile for a number of reasons. To begin, some refused to join on account of the early chauvinist noises—made by several members, including Ghalioun himself—about retaining the Syrian republic’s “Arab” identity. More recently, others have worried about inadequate Kurdish representation on the Council. Many Kurds feel underrepresented in the SNC’s General Assembly, or its parliamentary base: They’ve got an estimated 22 seats in the 230-member body, although the exact number of their representation is unknown as the names of in-country Syrians have not been disclosed to the public and, in the weeks since the SNC’s formation, many Kurds have quit. The Kurds also feel cheated because they’ve only been allocated four seats in the 29-member Secretariat, the main decision-making echelon of the SNC. They claim they were promised one or two more seats owing to their proportionate participation in the umbrella bloc of the so-called Damascus Declaration, the traditional Syrian opposition group formed in 2000 when its founders—a cross-section of Syrian intellectuals and reformists—thought that Bashar was going to play the Khrushchev to his late father’s Stalin. In reply, the SNC says the Kurds are trying to double-dip, asking for both ethnic and non-sectarian representation at the same time. Potential Turkish meddling in the SNC’s affairs is a big problem because Kurdish separatism is still the prism through which Ankara views all regional convulsions. Erdogan may voice sympathy for the Palestinians and other stateless peoples, but he’s not nearly as sympathetic when it comes to the PKK, which still wreaks havoc in eastern Turkey through terrorist attacks on soldiers and civilians. Last year, Erdogan threatened to drown the PKK “in their own blood,” a promise he’s since made good on with ferocious retaliatory strikes that extend into Iraqi Kurdistan, long thought to be the PKK’s base of operations. In light of this history of bad blood, Ghalioun’s reference to Kurdish rights in a broadcast from Istanbul is not idle phrasemaking. A Sorbonne sociologist known as much as for his Arab nationalism as for his secularism, Ghalioun is trying to signal both to the Kurdish minority and to anyone else paying attention that the SNC is still very much its own show, not the script-reader of Ankara. Later this month, the Kurdish National Council, which presents itself as an alternative, strictly Kurdish-Syrian opposition group, will convene in Erbil, in the Kurdish Autonomous Region of Iraq, to decide whether it should suspend participation in the SNC. The Syrian opposition can scarcely afford to let this happen. It took them eight months to form a transitional body worthy of being shopped for international legitimacy. By contrast, the Libyans took about two weeks to form the National Transitional Council, which remained relatively cohesive and united through the six-month campaign to topple Qaddafi. To ensure that Syria’s Kurds don’t abandon the opposition, the SNC needs to move fast with a number of concrete reassurances, including increased representation in all decision-making bodies and the speedy drafting of a provisional constitution that would spell out, in no uncertain terms, what the Kurds can expect in the post-Assad era. Here’s where the U.S. State Department, rather than the Turkish Foreign Ministry, ought to lead from the front. Michael Weiss is the communications director of the Henry Jackson Society, a London-based foreign policy think tank, and a blogger for The Daily Telegraph. He is the co-author of The Syrian Opposition: Political Analysis with Original Testimony from Key Figures.